East Baltimore's "I Am An American Day" parade is captured in a unique 1981 news program from WJZ-TV and a book of documentary photographs showing the people and places of East Baltimore in the late 1970s. The book collected photos from the East Baltimore Documentary Photography Project which was inspired after the photographer and creator of the project Linda attended the parade in 1975. In Baltimore, the annual parade moved to the streets around Patterson Park and quickly began to draw thousands of participants. The 1944 march saw an estimated 23,000 people. The next year, around 75,000 people came out to see 100 groups of marchers along with 50 "bands and drum, fife and bugle corps" By the 1970s, the parade had steady attendance from church groups, veterans organizations, and politicians developed into what the Baltimore Sun writer Liz Atwood later called "an opportunity for Baltimoreans to show their pride in being Americans." 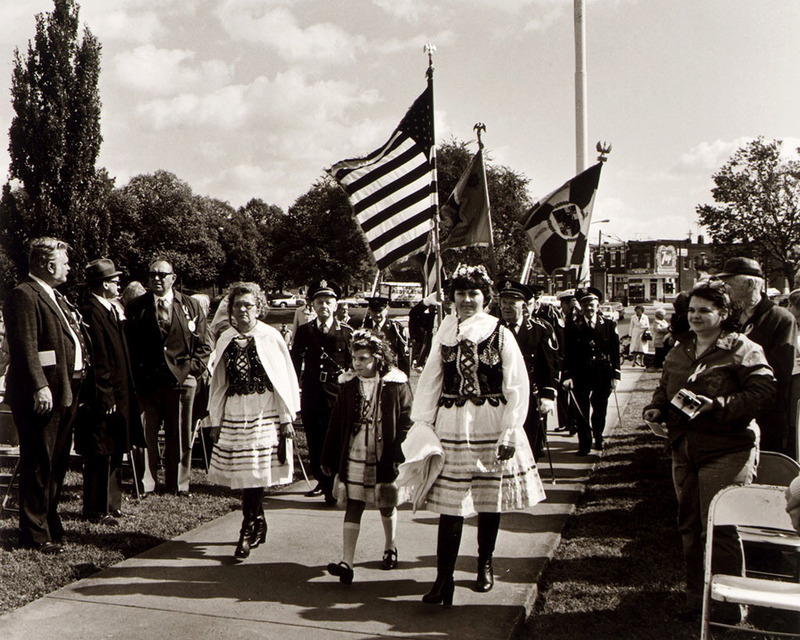 By the mid-1990s, the parade followed a naturalization ceremony for new citizens. Over the years, special guests at the parade included actors from popular soap operas and Hollywood movies. Huge crowds gathered for the route to watch and hear local high school marching bands and out-of-town draws like the Philadelphia Mummers Quaker City String Band. At the parade's height, the event drew over 300,000 people and lasted four hours or more. In 1975, Maryland Institute College of Art photography professor Linda G. Rich was among the crowd. According to the Maryland Historical Society, Rich was new to Baltimore and was "struck not only by the patriotic display of the celebration but by the unique characteristics of the surrounding neighborhood: the rows of clean, white marble steps, the vibrant painted screens, the window displays full of religious and patriotic iconography." The next year, Rich, along with her students Joan Clark Netherwood and Elinor B. Cahn started what became the four-year-long East Baltimore Documentary Photography Project that captured over 10,000 photographs capturing the area's strong sense of community and unique identity. Southeast Baltimore has changed in radical ways since the 1970s and the "I Am An American Day" parade changed as well. Unfortunately, in 1993, the city's effort to raise fees for the event led parade organizers to threaten to move the event away from Highlandtown and Patterson Park. Edwin F. Hale, Sr., then chairman of Baltimore Bancorp, wrote a check to cover that year's extra expenses but, in 1994, no other benefactor came forward and organizers moved the event to Dundalk in southeastern Baltimore County where it continues to be held through at least 2014. Eli Pousson, “I Am An American Day Parade,” Explore Baltimore Heritage, accessed April 23, 2019, https://explore.baltimoreheritage.org/items/show/663. Talbot, Damon, "Scenes from the ’70s: The East Baltimore Documentary Photography Project," underbelly, Maryland Historical Society, January 30, 2014. Rich, L. G., Netherwood, J. C., & Cahn, E. B. (1981). East Baltimore: Tradition and Transition. A Documentary Photography Project (Photo Essay). 7 (3), 58-75. Published on Dec 6, 2018. Last updated on Feb 19, 2019.